When is Miku’s Birthday? Miku’s birthday is what day in August? What is a good way to celebrate Miku’s birthday? Some thoughts on Miku’s Birthday. 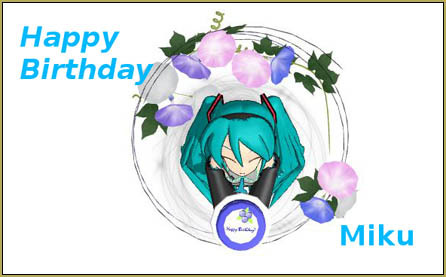 Today, August 31, being Miku’s Birthday, I would like to share some of my thoughts on this occasion. Even though today is her birthday and her original voice bank is seven, she remains sixteen years old. For a sixteen year old girl she has made, and will continue to make a big impact on today’s society. Without Miku, the Vocaloid software would not be as popular as it is today. About five vocaloids had been released before Miku’s release in 2007. It was with the release of Miku that the popularity of Vocaloid took off. Originally developed as a professional software, Miku’s popularity spilled over to the amateur side. With this came the birth of a community based on collective creativity. This idea has spawned many derivative applications to enhance one’s creativity, including Utauloid and MikuMikuDance. Miku’s image can symbolize the creativity of the community as her image is based on the creator’s ideas and is not set in stone (Short history of MMD Miku Models Part 1, Short history of MMD Miku Models Part 2) . In fact, for the initial cover-image of Miku for the Vocaloid Software, the artist who designed Miku, Kei Garo’s only direction was that she was an android and her color scheme: turquoise color. As time passes, Miku, Vocaloid and the community continues to evolve. This is shown through the development and re-release of many Vocaloid characters in Vocaloid3, which includes an English version and specialized version … as well as her performing sold-out 3D concerts. Hilarious, how we all think Miku is still 16 seven years later. 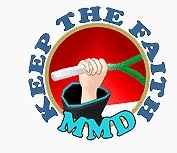 BTW, I don’t receive confirmation emails from learnmmd.com even in my spam folder.